Not quite as exciting as banding oystercatcher chicks, but still worth noting. 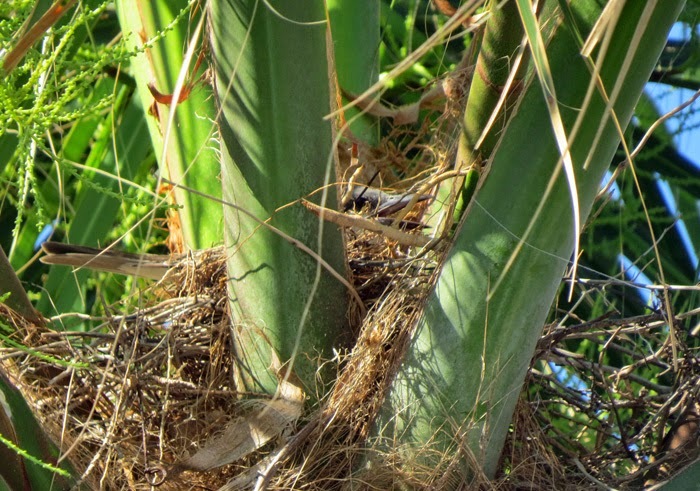 The female gray kingbird is sitting on her nest in the top of a palm tree in the parking lot of the Ocean Plaza Resort. She did not, after all, make a nest in the sign. 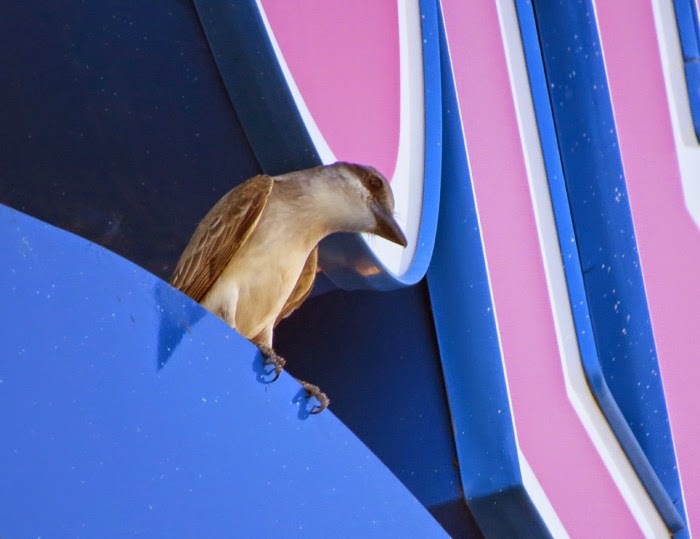 Her mate keeps watch nearby, often perched on the sign itself. One hazard of nesting above a parking lot is cars and car mirrors. I watched as presumably the male attempted to drive off the intruder reflected in the windows and mirrors. 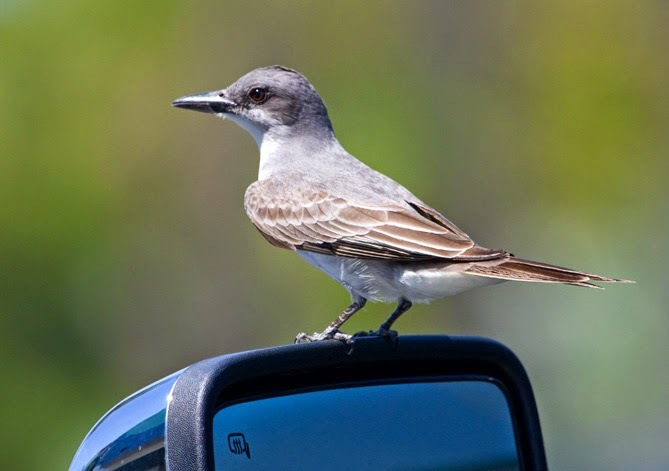 Gray kingbird on car mirror. 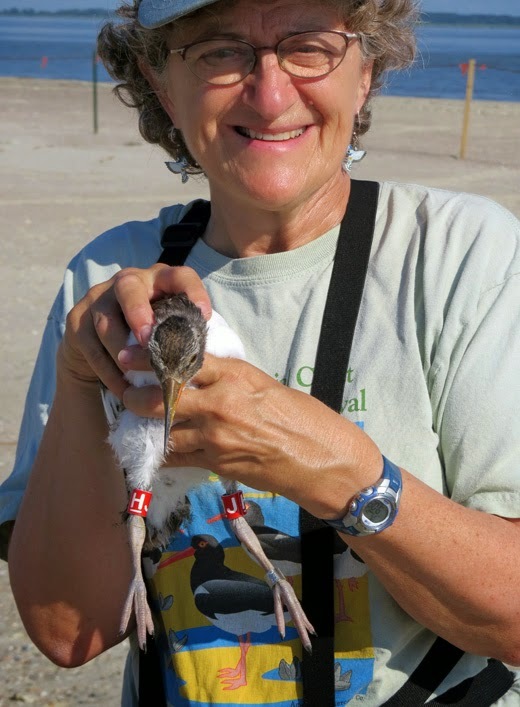 American Oystercatcher chicks are banded! 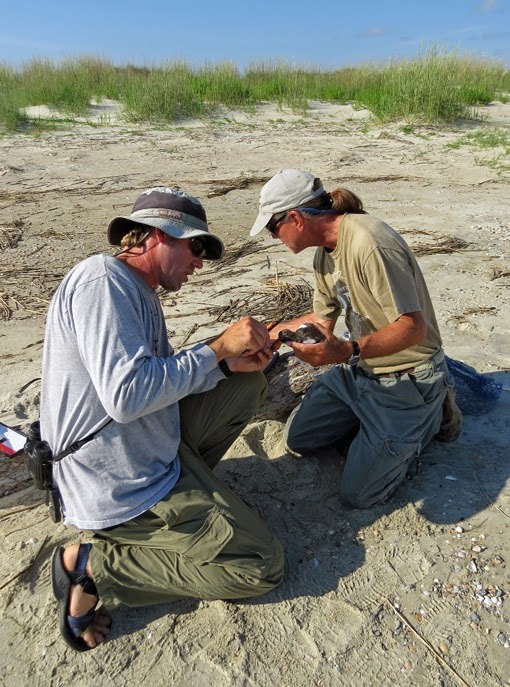 I had the great privilege of accompanying Tim Keyes and Chris Depkin with Georgia DNR and Danny Carpenter with Tybee DPW to the North End of Tybee this morning to band our 2 young American Oystercatcher chicks. They were about 28-29 days old, with one chick being a bit larger than the other. I wondered how they would accomplish the task. We were lucky to find both chicks with an adult hanging out on the beach, rather than back in the dunes. As we watched, a second adult flew in bringing food which it gave to one of the chicks. Chris and Tim positioned themselves carefully. 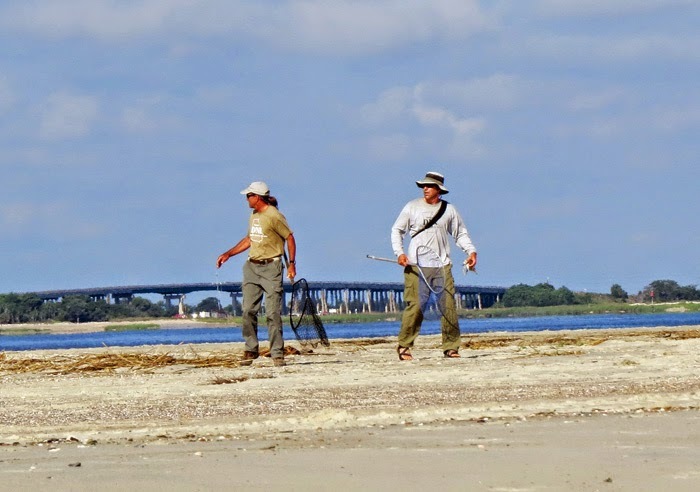 Tim walks toward Chick# 1 with the net. I was given the task of keeping an eye on Chick #2 while they went after Chick #1, so I didn't actually see the capture. I just looked over and Tim was holding Chick #1. The adult was nearby watching and was obviously not happy with the situation. Tim handed off the first chick to me while he focused on "2, who fortunately ran towards him, rather than back into the dunes. Soon that one was also in hand. Danny Carpenter with Tybee DPW and I each held a chick while Tim and Chris set up their mobile banding lab on a log within the roped off area. 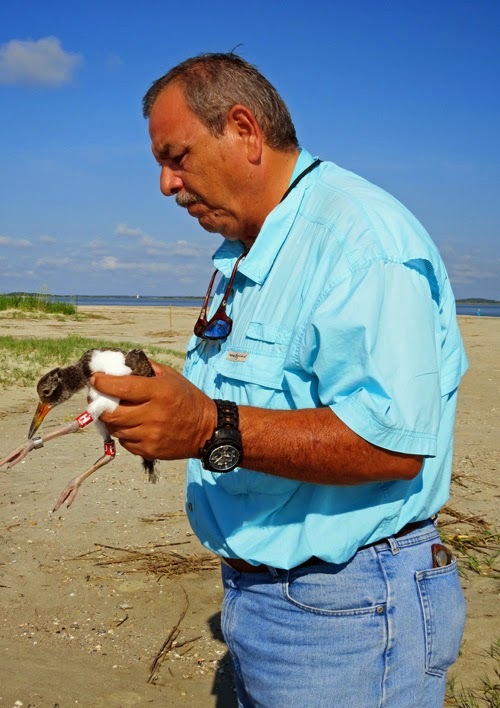 Danny Carpenter holds one of the chicks after it is banded. 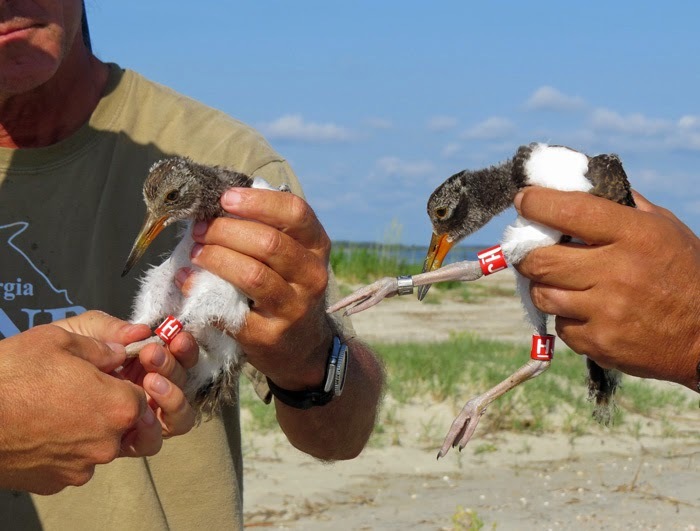 Each chick was fitted with a silver US Fish and Wildlife metal band on the lower left leg, and each was given two red plastic bands - one on each upper leg, since oystercatchers stand on one leg a lot. These two are now HH and HJ, with the first H underlined. 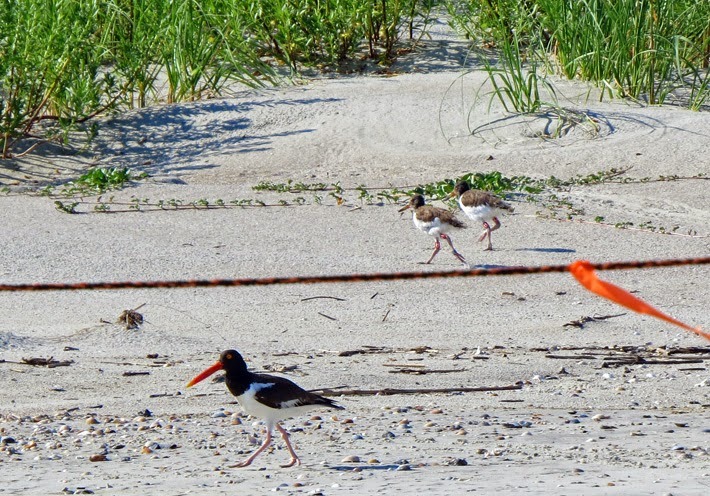 All oystercatchers banded in Georgia are banded with red bands. Each state up and down the east coast has its own color. 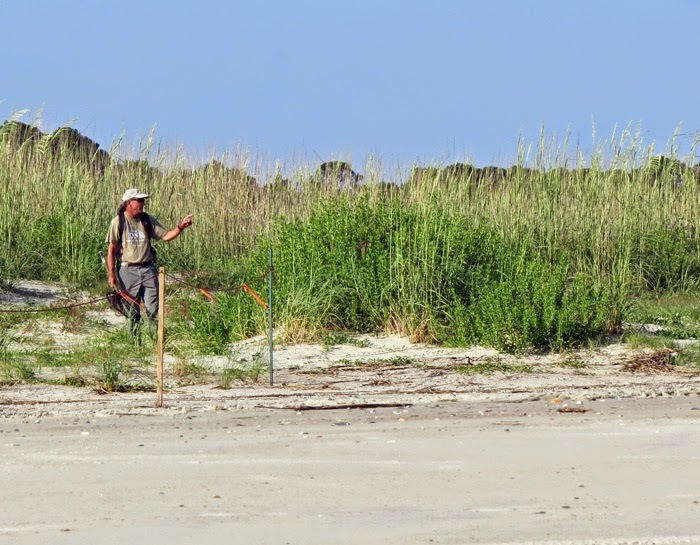 For 8 years now, I have been studying the flocks of American Oystercatchers on the north end of Tybee and taking photos and reporting banded birds. This is the first time I've gotten to be present at the banding. Diana holds HJ before its release. 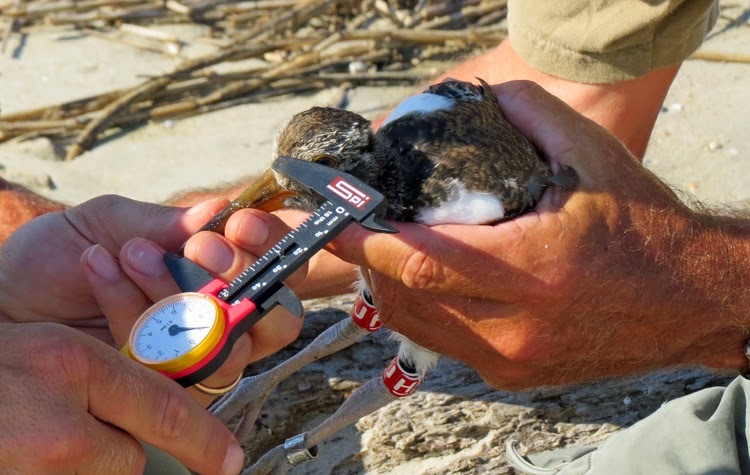 Once both birds were banded, weighed and measured, it was time for the next tricky part - the release. 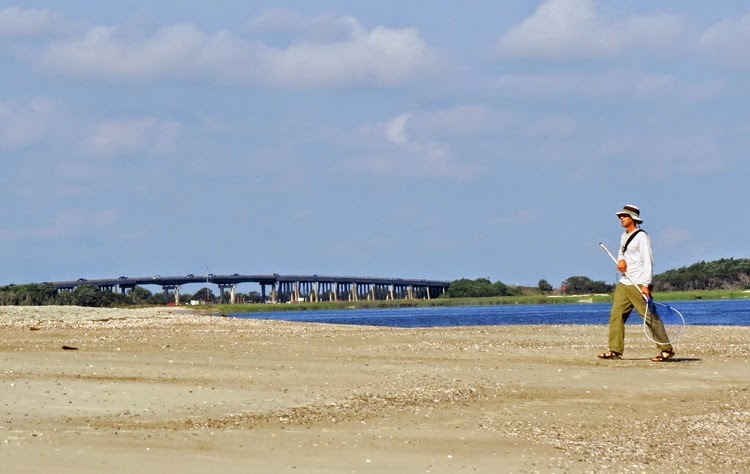 We could see an adult waiting nearby on the sand. We walked down towards the water, with Danny and I each carrying a chick. Then we went up to towards where the parents stood and each knelt down to place our charge gently on the sand. Immediately, both chicks ran towards the parent and all three went towards the dunes and inside the roped off area. Success! Adult and now-banded chicks are reunited. Oystercatcher chicks HH and HJ back on the beach wearing their new jewelry.